At Carey we support and encourage all students to pursue their interests and achieve their best. Excellence and scholarship take many forms and can be achieved in a multitude of areas and in countless different ways. The online Oxford Living Dictionary has four definitions for the word scholar. The first is, ‘A specialist in a particular branch of study, especially the humanities.’ As a humanities teacher I wholeheartedly endorse this definition! The Dictionary also defines a scholar as ‘A person who is highly educated or has an aptitude for study’, and the definition for scholarship they offer is ‘Academic study or achievement; learning at a high level’. These descriptions relate to academic endeavour and achievement, not just outstanding results measured by an ATAR. These two definitions ought to apply to us all, while we are at school and thereafter, as Carey encourages and supports the development of skills for and an appreciation of lifelong learning. While we celebrate the diversity of achievements of our Year 12 Class of 2018 and the many forms of scholarship we witnessed, we also celebrated the top ATARs of the year level in the Scholars Assembly this week. 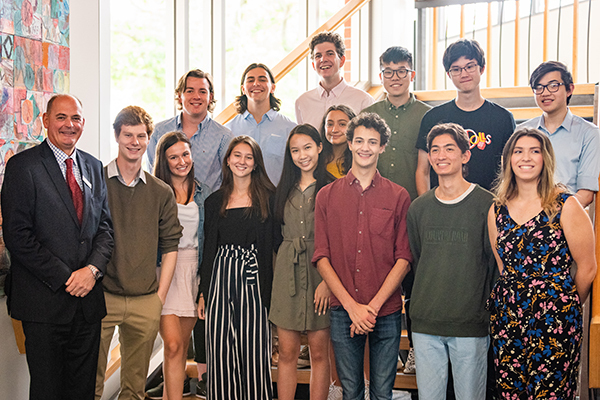 As in previous years, we welcomed back, celebrated and acknowledged the accomplishments of students who obtained an ATAR of over 99; a result which places these students in the top 1% of all who completed Year 12 last year. At the Assembly we were very fortunate to hear from three past students, now pursuing different pathways, who spoke about how they approached Year 12, what made it successful for them, and their plans for the next few years. Liam Croucher, our first speaker, is one of five Carey Duces of 2018, attaining ATARs of 99.85. Liam spoke about the joy of learning when studying his areas of interest and related how he applied his soccer coach’s message to ‘leave nothing on the pitch’ to his studies. Liam certainly achieved this, scoring 44 out of a total 45 points in the IB. Liam left Carey having received awards for Debating, Soccer, Futsal, Drama, Musical Theatre, Excellence in the Performing Arts and numerous academic awards, as well as being Hickman House Captain. Having made the decision to move from a small girls’ school at the end of Year 11, our second speaker Georgia Lord described Year 12 at Carey as the best year of her life so far. In contrast to the singular academic, high-stress environment of her past school, Georgia commented that at Carey she felt recognised and supported as a whole person. Georgia studied the VCE, and was awarded a Speech Night Subject Prize at the end of Year 12. Two of her final study scores were 48 out of 50, with her overall average in the 40s. Our final speaker Victoria Sdralis was at Carey for many years. She was actively involved in co-curricular activities, receiving Colours for Orchestra and Choir and Insignias in other activities, as well as Academic Colours and Speech Night Academic Awards. She achieved an ATAR of over 99 and scores of 50 out of 50 in two of her VCE subjects. Victoria’s progression into Year 12 was not as straightforward as she had anticipated, reconsidering her subject choices and making the decision to change one of her subjects at the end of Year 11. This decision was reinforced when she received her results, obtaining a perfect score in this subject. While the three speakers all had different paths and interests, they shared some common advice for current Year 12s. They each emphasised the importance of maintaining a balance between academic pursuit, wellbeing, exercise, life outside of school and crucially, the significance of good sleep. I trust this resonated with and encouraged our current students.